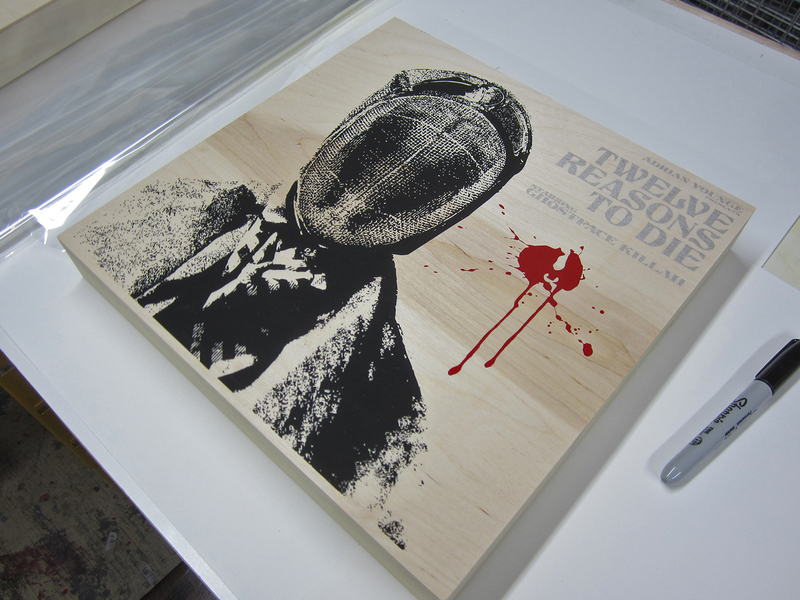 We recently had the opportunity to collaborate with Get On Down on a Deluxe Edition of Ghostface Killah’s latest album, 12 Reasons to Die. Produced by Adrian Younge, the album has been described as a movie for your ears and is a must listen as far as we’re concerned. While that video was being made, we had the idea to create the print you see in that video (3-color print on white box) onto some wood panels Jay LaCouture had been doing his personal work on. The wood panels were just a little bit smaller than the white boxes, but we improvised the press for the couple pieces we created. The sentiment was that we all do so much work with each other and we’re so busy getting all these projects done, we never take the time to say thank you. And that’s all it was. We printed two wood panels that day and surprised the folks at Get on Down with the prints. They looked great and Matt and crew responded to them really well. 10 minutes later, we’re discussing creating a Private Press version of the album that included the wood panels along with a slew of other items. The rest is history. We created 100 wood panels for the Private Press edition and they sold out on Get on Down in about 48 hours or so.